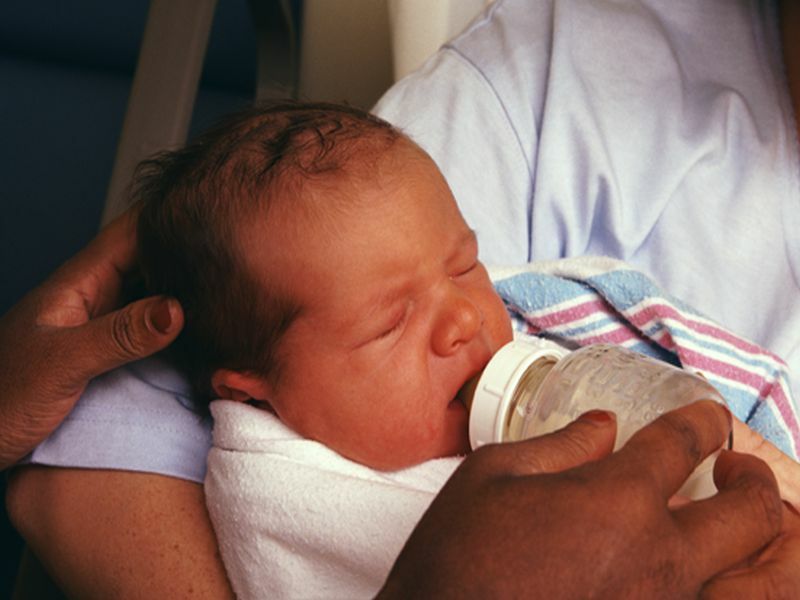 TUESDAY, March 8, 2016 (HealthDay News) -- Many parents who worry that their baby is at risk of asthma, allergies or type 1 diabetes may turn to special cow's milk formulas touted to lower the risk. But a new review of the data on these "hydrolyzed" infant formulas finds no good evidence that they actually protect children from the autoimmune disorders. "We found no consistent evidence to support a protective role for partially or extensively hydrolyzed formula," concluded a team led by Robert Boyle of Imperial College London in England. "Our findings conflict with current international guidelines, in which hydrolyzed formula is widely recommended for young formula-fed infants with a family history of allergic disease," the study authors added. One expert in the United States said the finding casts doubt on the usefulness of these special formula products. "Allergies and autoimmune diseases [such as asthma and type 1 diabetes] are on the rise and it would be nice if we did have a clear route to preventing them," said Dr. Ron Marino, associate chair of pediatrics at Winthrop-University Hospital in Mineola, N.Y.
"Unfortunately, despite U.S. Food and Drug Administration support [for hydrolyzed formula], the data are not compelling," he said. According to the British researchers, many infant feeding guidelines worldwide -- including North America, Australasia and Europe -- recommend hydrolyzed cow's milk formula instead of standard infant formula to prevent autoimmune disorders during the first months of life. Dr. Punita Ponda is assistant chief of allergy and immunology at Northwell Health in Great Neck, N.Y. She stressed that when it comes to infant feeding, breast milk is by far the healthiest option. However, "current mainstream guidelines for infant formula do recommend that parents consider using hypoallergenic formula if a close family member -- like an older brother or sister -- has a food allergy," she said. That was based on prior studies supporting some kind of protective effect, Ponda said. However, the U.K. team found no consistent evidence to support the recommendations, according to their review published March 8 in the BMJ. In the study, Boyle's team looked at data from 37 studies that together included more than 19,000 participants and were conducted between 1946 and 2015. The investigators found that infants who received hydrolyzed cow's milk formula did not have a lower risk of asthma, allergies (such as eczema, hay fever, food allergies) or type 1 diabetes compared to those who received human breast milk or a standard cow's milk formula. The researchers also found no evidence to support an FDA-approved claim that a partially hydrolyzed formula could reduce the risk of the skin disorder eczema, or another conclusion that hydrolyzed formula could prevent an allergy to cow's milk. Both Marino and Ponda believe that, based on the new report, it may be time to revisit guidelines that recommend hydrolyzed formula. "It is interesting that this [review] also finds conflict-of-interest and bias in many of the published studies" that supported the effectiveness of hydrolyzed formulas, Marino said. His opinion? "Most kids will have their best shot at a healthy life being raised on human breast milk," Marino said. Ponda agreed that "the current recommendations might need to be revised." And she added, "even if there is no harm in using these formulas, they are often more costly and harder to find in the grocery stores."